The aviation finance sector has been in a period of change in recent years and has attracted new market entrants that have diversified financing and funding mechanisms. In addition, the debate on the impact of new technology advancements and the new proposed accounting standards has challenged traditional views on asset and residual values, depreciation rates and useful economic lives. Airlines, lessors, aircraft traders and investors are facing exciting challenges in an industry with very promising global prospects. In this environment they must adopt new approaches to address regulatory requirements and business risks, whilst meeting the imperatives of expanding globally and achieving sustainable growth. 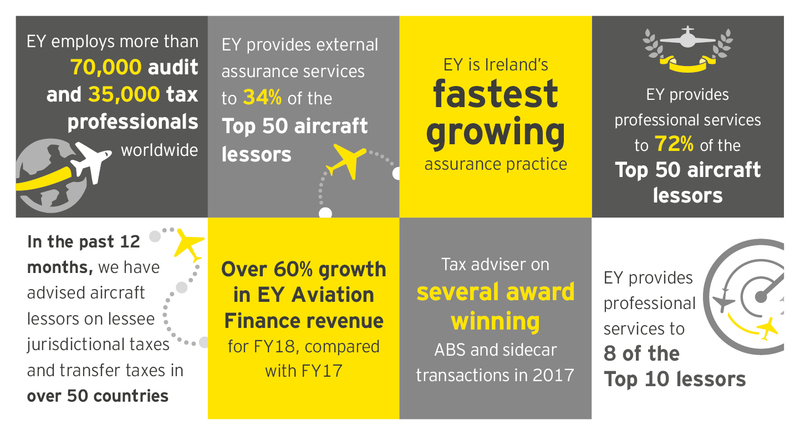 Our global tax practice is committing significant resources to the aviation sector in Ireland and key countries that align with the growth markets. There is a high correlation between the location of airlines investing in aircraft and the location of investors. Investment in new aircraft over the next 20 years will be heavily concentrated on airlines in the Americas and Asia Pacific and the equity and debt to finance the sector is coming from these areas. EY is the leading global provider of professional services to the aviation sector, with over 2,000 professionals worldwide providing services to nearly every facet of the industry. We are unique in being the only Big 4 firm to have invested in a formal Global Aviation Sector Group, to address technical issues, coordinate knowledge sharing and leverage our vast industry experience for the benefit of our client.